Making Tax Digital (MTD) is a UK government initiative that sets out a vision to transformed tax system by 2020. HM Revenue and Customs (HMRC) states that the main goal of MTD is to make tax administration more effective, more efficient and simpler for taxpayers. In July 2017, the government announced an amendment to the initial 2020 vision which meant, the first step towards the transformation and modernisation of tax is VAT. 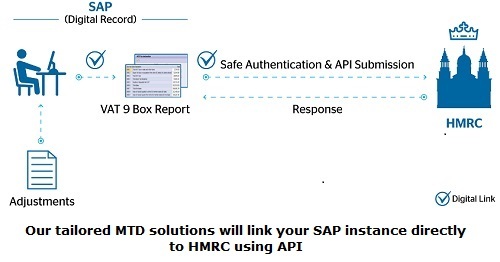 VAT return submissions must be done digitally via HMRC’s Making Tax Digital APIs (Application Programming Interface). MTD will involve significant changes to both process and technology and many organisations will suddenly find their existing process will no longer be complaint. Here at Atos UK& I we can help prepare your business be MTD ready with process and technology support. Atos has kept pace with every change in SAP as a technology for over three decades. Atos SAP bespoke MTD solution provides a cost-effective choice to managing indirect Tax. Our package solution comes with a competitive pricing model.